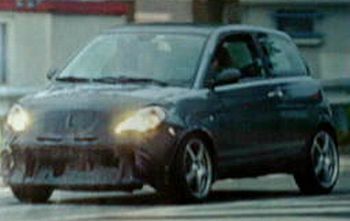 Spy shots have appeared confirming the existence of a performance version of Lancia's popular Ypsilon supermini. Likely to called 'Sport' when it debuts at Geneva in a month's time, the latest addition to the Lancia range heralds a much-anticipated return to sporting values for the luxury arm of the Fiat Group. The new model will be powered by the same 150bhp 1.9 16V Multijet diesel which is already available in the Alfa Romeo 147 and GT Coupe. In these cars it offers sprightly performance, so the signs regarding the potential performance of the (lighter) Ypsilon Multijet are promising indeed. 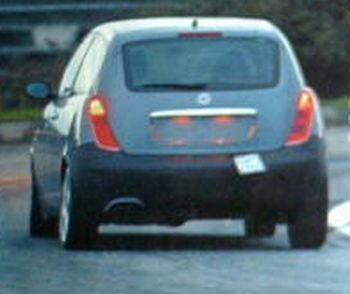 The car seen in these photos runs on 17-inch alloy wheels, new-design bumpers, lower and firmer suspension than the standard car, and appears to have a unique twin-pipe exhaust. The wheels in particular fill out the arches of the car very well, completely abolishing the slightly under-tyred look of the standard versions and perhaps hinting at a wider track to complement the increased performance. The nature of the car, a sporting variant fitted with a diesel engine, means that while it cannot hope to trump the ultimate, raucous, petrol-powered hot hatches (such as the forthcoming new-generation Punto Abarth, Renault Clio 182, Peugeot 206 GTI 180, Seat Ibiza Cupra 1.8 and Opel Corsa GSi) on performance, it represents an upmarket, more refined and punchy take in the Lancia tradition, and is a worthy addition to the lineup. Instead, it can be regarded as a rival for the new Seat Ibiza Cupra diesel, Skoda's Fabia vRS, Volkswagen's Polo GT and Ford's Fiesta ST150. To be competitively priced, the car is set to carve out its own niche in the burgeoning diesel hot hatch market and carry on the successful sales performance of the existing models. The Ypsilon Sport is not the first Lancia supermini to be breathed on by the factory in the quest for a more sporting drive. 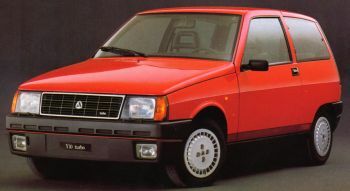 The previous Y featured a variant known as the Elefantino Rosso, which whilst keeping the standard 80bhp 1.2 16V engine of other models, also included a close-ratio gearbox and lowered suspension to enable the driver to make the most of the available performance, while if one delves even further back into the history books, we arrive at the Y10 Turbo. Developing 85bhp, this was at the time the most powerful 1-litre production car ever built, which in a car of the Y10's light weight made for entertaining performance to say the least. This was eventually superseded in 1989 by a 78bhp, 1300cc normally-aspirated unit, dubbed GTie, which kept up Lancia's efforts in the class until the arrival of the 1995 Y.